How did the popularity of supermarkets change the American diet? Let’s find out! When the supermarket became popular in American society in the 1950s and 1960s, there were several dietary implications. These implications were both positive– supermarkets made a more diverse diet available and accessible to more people– and negative– supermarkets reduced the ability of marginalized populations to purchase a high quality diet, and it encouraged the consumption of energy-dense, nutrient-poor, highly-processed foods. The most universal dietary implication that supermarkets had on American consumers was that it encouraged them to eat more, whatever the food. Before supermarkets became popular, food shopping was not always easy. In the late 1800s and early 1900s, a housewife who usually prepared the home-cooked meal would have to go to various places to get food for her family. This would include a stop a the butcher for meat, a stop at the fruit store for fresh produce, purchasing milk from a milk wagon, and for other goods going to the local grocer, who would fill their order and get their products from the back of the store. 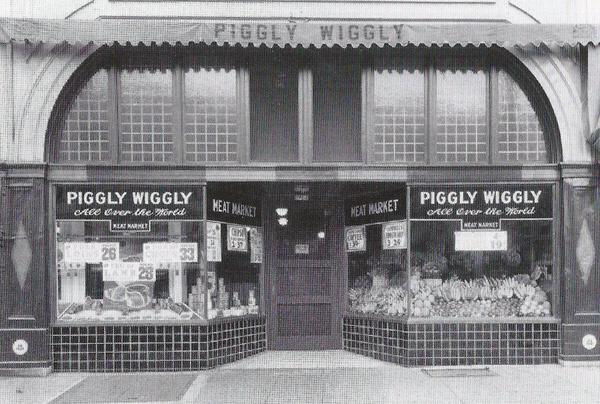 In 1916, Clarence Saunders founded Piggly Wiggly in Memphis Tennessee. This was the first establishment in which the customer could pick out their own food. However, the term “supermarket” was not even used yet. Cars were a major factor that helped the growth and popularity of supermarkets. However, not only the car itself, but the invention of the ignition switch was one of the biggest factors in the growth of the supermarket. Previously, housewives had to limit their shopping to stores within walking distance; it was too difficult and dangerous to turn the starter crank to get the car started. But once there was an easy way to start the car, housewives were able to travel further to get a bargain. SUBURBANIZATION also had a large impact on the growth of supermarkets. This general trend of city dwellers to move from the city into residential areas exploded after World War II around the 1930s and 40s. Suburbs developed their own shopping centers and supermarkets and bred their own distinct lifestyles. 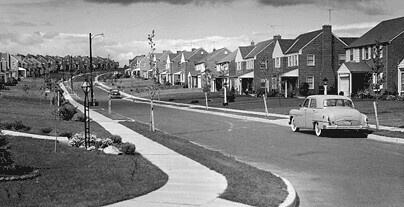 The suburban diet relied heavily on the foods provided from supermarkets, which also started to alienate Americans from where their food was coming from. By the 1950s, supermarkets accounted for 35% of all food sales in America, and by 1960, that figure was 70%. In the 1950s, convenience was very important, and with the convenience foods available in the supermarkets, meal preparation was easier than ever before. Advancements in technology also led to faster meal preparation. In 1941, the federal government established the first Recommended Dietary Allowances. By looking at the progression of food guides established by the USDA (United States Department of Agriculture), it is evident that the supermarket changed some ideas of what foods can and should be eaten.